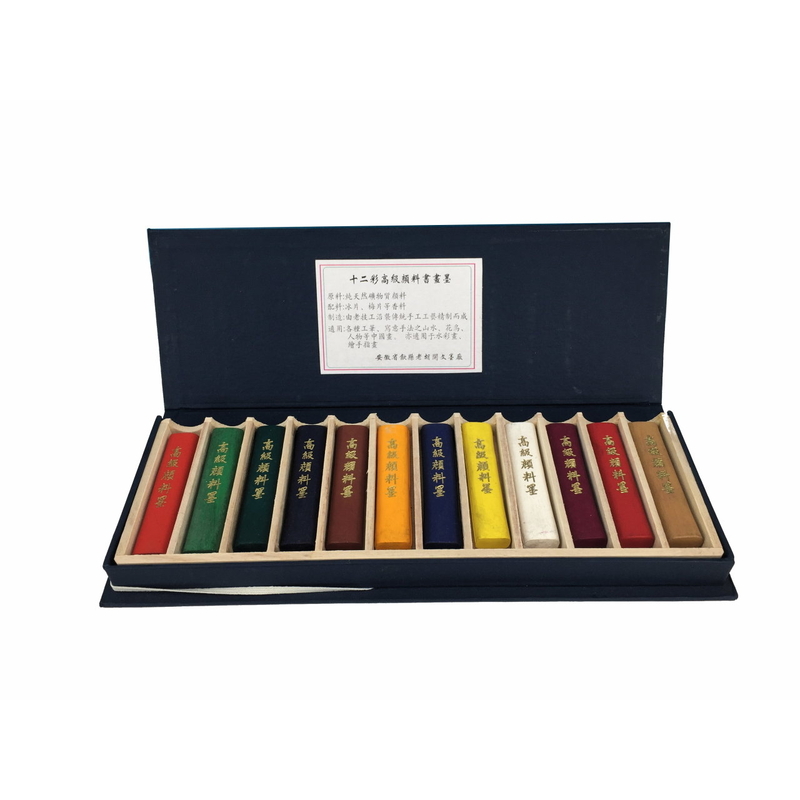 Handmade natural mineral color ink sticks, set of 12 colours, handmade by the Old Hu Kai Wen ink workshop. 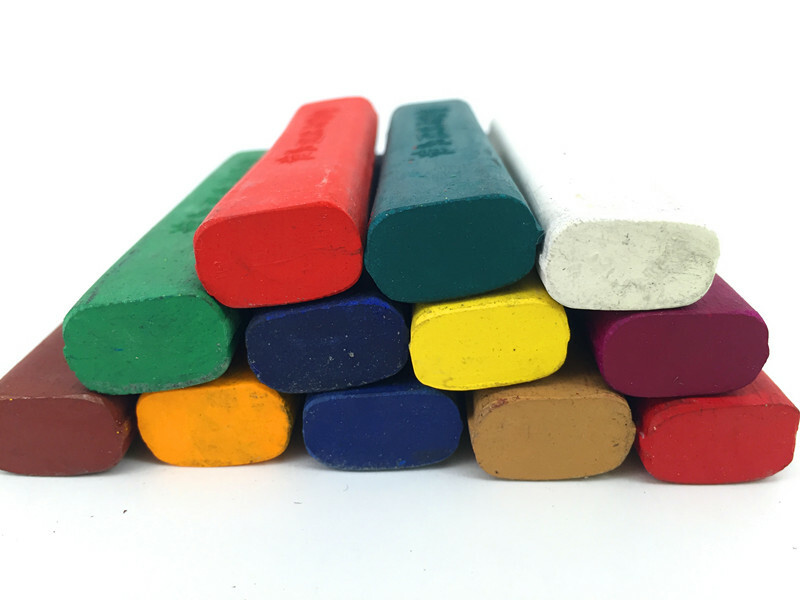 The box contains the 12 most used colours. 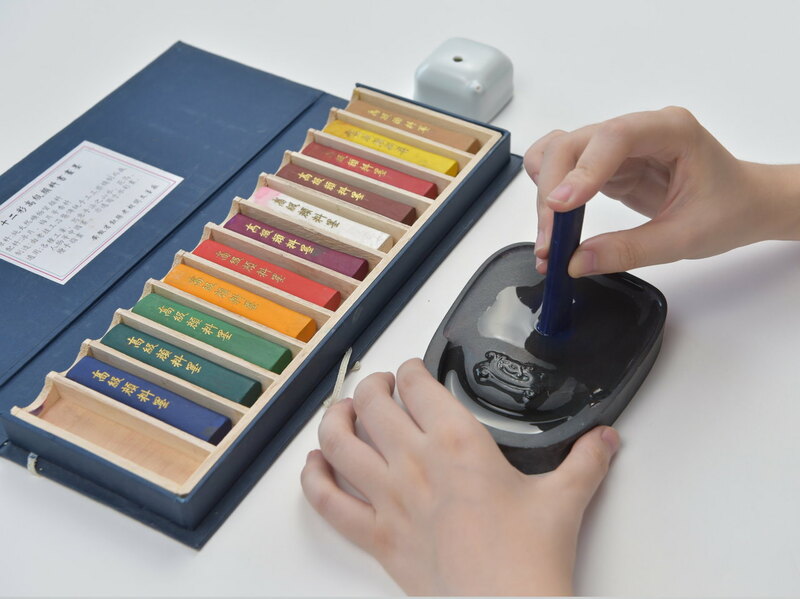 The colours can be used for water color painting, and Chinese ink painting. Each ink stick is 7.8 cm by 1.8 cm by 1.1 cm. The whole box is 30 cm by 11 cm by 2.5 cm. 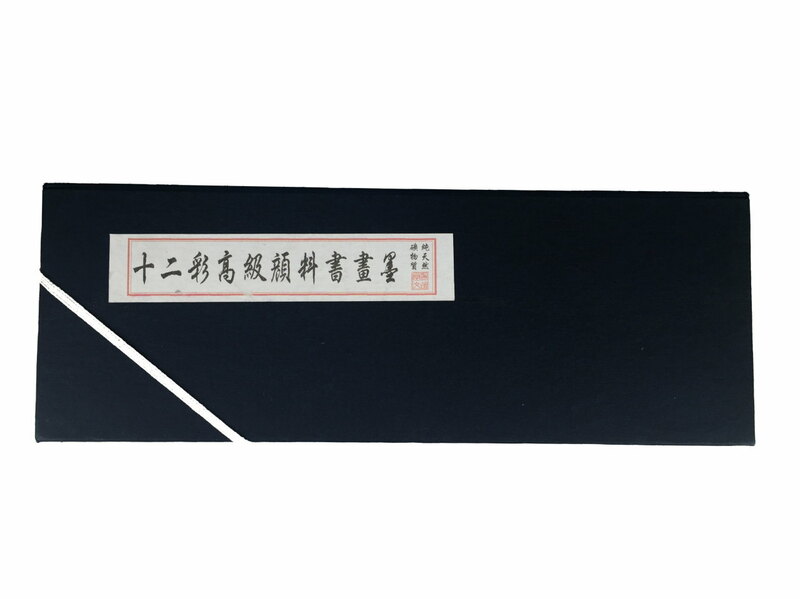 Each ink stick is 36.25g, the total ink sticks net weight is around 435g. Old Hu Kai Wen Ink Factory is the most prestigious Ink Manufacturer in China. 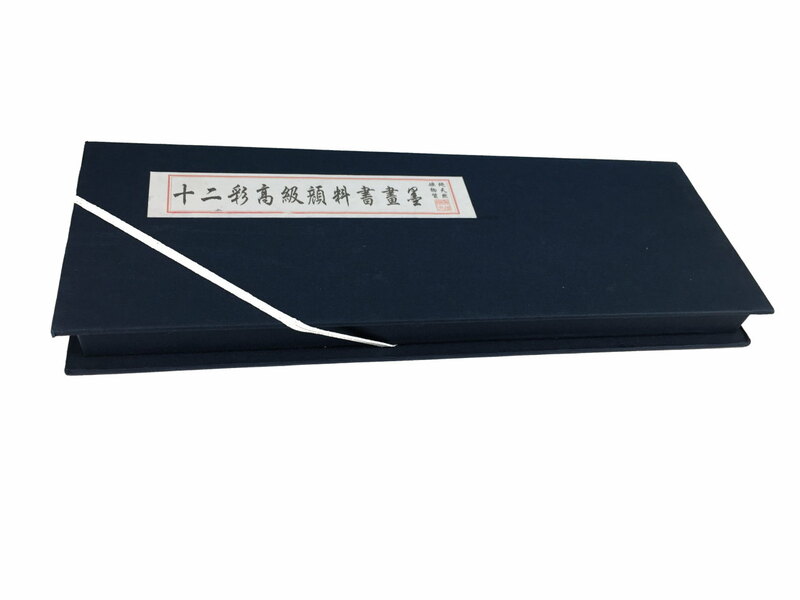 It was established over 250 years ago and supplied ink to the Chinese imperial family. 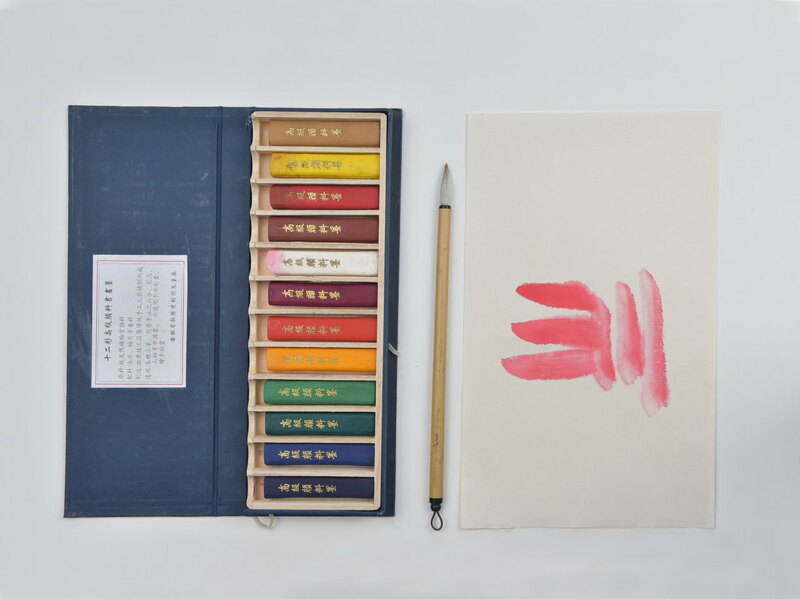 This palette of color ink sticks is made with the most traditional craftsmanship. The raw materials are extracted from natural mineral rocks. The colours will not fade with age. Beautiful craftsmanship! Strong, bright color and easy to grind. Highly recommended – Inkston is so professional and helpful! Highly impressed at the quality and rich color of these Sumi ink sticks! Long lasting, easy to use, beautiful phoenix design! They come with a nice, lined case to store them! Perfect for beginners or experts! Very competitively priced! 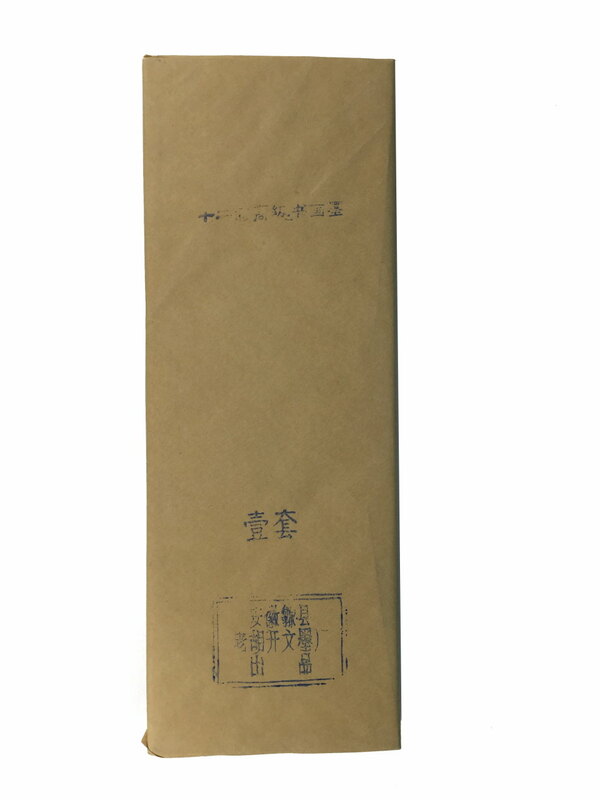 The Xuan paper included is a very large size, and a great gift! Very professional color kit! I do not understand where this is used for? Layering colors? Son un poco duras y cuesta deshacerlas y apenas cubren de color. Son muy bonitas y bien presentadas en su caja. good product and well packaged. I own this set of color ink sticks from Inkston. I enjoy using these sticks very much. Grinding the color sticks is a meditation for me getting my mind ready to paint. I enjoy this Asian painting tradition. The color you get from these ink sticks is beautiful and strong. Well worth the time of grinding. Inkston is a wonderful company as well. Their products are top quality and they answer any question. I can give them and this product my highest recommendation. 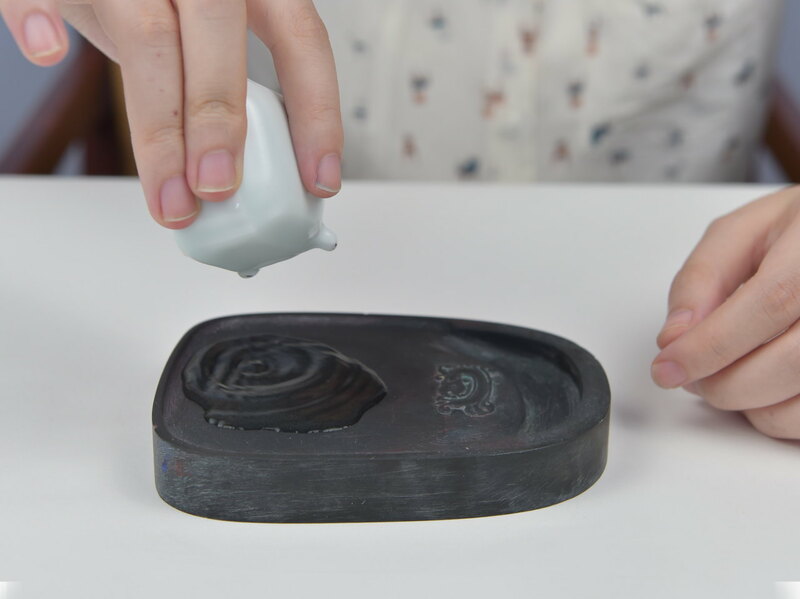 You will need an ink stone for grinding your ink as well. I have attached a photo of one of my ink grinding stones. Recien recibo de parte de AMAZON este precioso estuche que comercializa INKSTON. Se trata de 12 barras de pigmento para diluir con la piedra inkstone. Pigmentos de calidad superior y rendimiento tambien superior. En mi caso para utilizar como acuarela ( compongo mis propias paletas de colores a partir de este material). 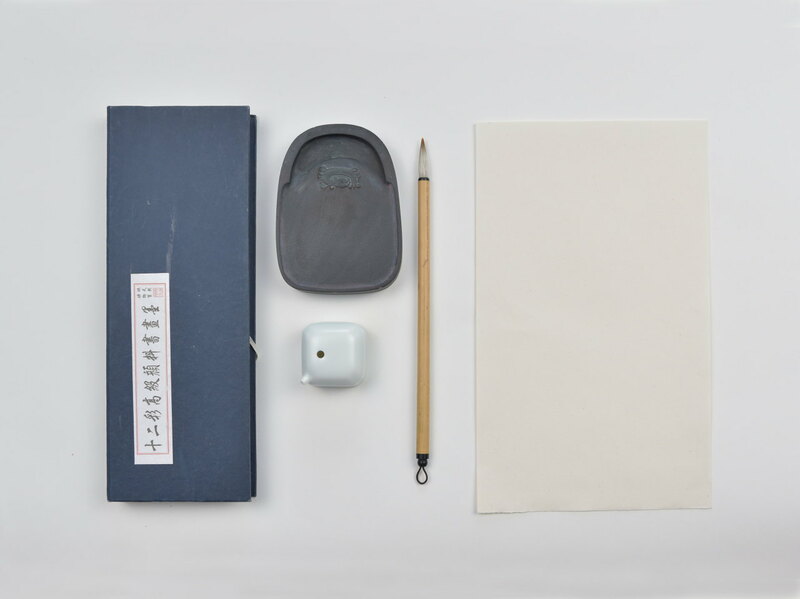 A destacar que el fabricante de este producto es Old Hu Kai Wen, es decir, el primer y mas pretigioso productor de barras de tinta y pigmentos de China. La distribuidora para el mundo entero INKSTON realiza una gran labor al ofrecer a través de su web propia y de AMAZON el amplio surtido de productos de Old Hu Kai Wen y otros de reconocido prestigio. Agradecido a ambos, a Amazon y a INKSTON por poner a nuestro alcance tan precioso y preciado material de bellas artes. Volviendo al estuche de las doce barras; cada una mide unos 7,5 cm y pesa unos 30 gr. Tres tonos de color verde. Un violeta. Un azul y una barra de blanco. Estoy realizando mezclas entre ellas y la variedad es infinita. Excelente producto a un precio imbatible. Old Hu Kai Wen Natural Mineral Colours. 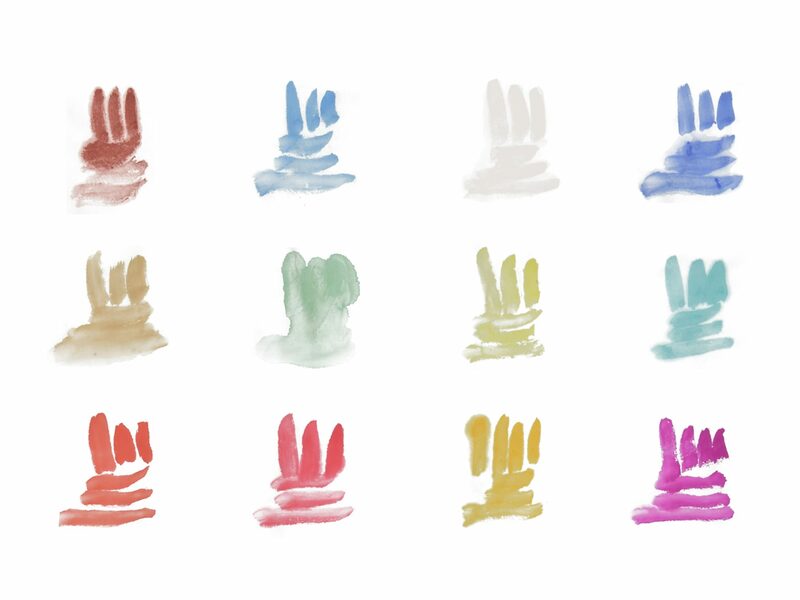 I like the colour inksticks very much, they catch the eye, are easy to grind and have rich bright colours with a sophisticated natural look. You can see immediately that they are high pigmented. The colours also blend together beautifully! Pongo 5 estrellas pero el producto merece muchas más. Las doce barras de colores minerales, son de una calidad extraordinaria. La presentación de lujo. Con esa base de madera realizada a la medida. Insuperable. En estos momentos he podido probar cuatro de las barras. El resultado está a la altura de las mejores acuarelas europeas. Los colores son algo menos vivos, pero su calidez y espíritu añejo los convierte en únicos. Voy a preparar tinta y a mezclar la entre sí ( diferentes barras de color) , intuyo que los tonos resultantes pueden ser ILIMITADOS. El embalaje y la entrega perfectos. Este tipo de productos son EMOCIONANTES. A beautiful cinnabar ink stick. I have tried the colors on a Red Star double sheet of Xian paper and found that the reds and blues are augmented with a soluble color that bleeds from the basic stroke. the greens only slightly adulterated while the gold yellow is greatly soluble. The chocolate brown. possibly made with a red, bleeds a red color also. The colors are good but one must allow for the migrating color. I must apologize for leading you into believing that the Hu inks bleed!! bleeding if it were there.